In common with many other organisations, the Ffestiniog Railway Company has been anxious to learn more about the contribution that its employees made to the 1914-1918 War. 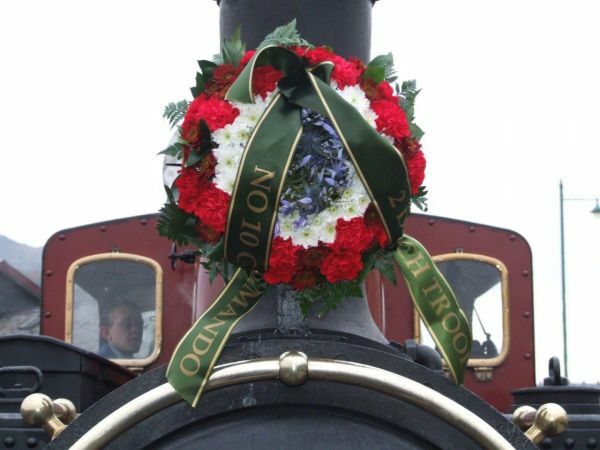 Consequently, members of the Ffestiniog Railway Heritage Group undertook to discover the names of the people who served their country, at the same time trying to establish more details of their individual stories. In May 2017, an appeal was made through social media and the various local media outlets, and as a result of this it was learned that at least two former employees lost their lives in the conflict. Both were unfortunately killed in action in France. The appeal is ongoing and we would welcome any information about family members who worked on the railway at the time with a view to paying tribute to their contribution to the War during 2018, the centenary year of its end. Photos of them would be particularly appreciated. On November 11th 2018 at 3pm., a newly-constructed war memorial, funded by the Railway Heritage Trust, will be unveiled at Tan y Bwlch Station to commemorate the sacrifices made by these men. There will be a short service of remembrance on site, and a display of items of rolling stock that saw service on the Western Front. A special train will leave Porthmadog Harbour Station at 1400hrs., arriving at Tan y Bwlch in time for the service which will take place at 1500hrs. Light refreshments will be served on the return journey, and the train will arrive back in Porthmadog at approximately 16.30hrs. Bookings are open to staff and members of the public. There will be no charge for travelling on this train, however places must be pre-booked. Please either call our booking office on 01766 516024 or email bookingoffice@ffwhr.com to confirm your attendance.